Activists who demand the extradition to Israel of two French nationals who are responsible for the hit and run in which Lee Zeitouni was killed disrupted French singer Patrick Bruel's performance at Tel Aviv University's Smolarz Auditorium Wednesday night. Frenchmen responsible for the death of the twenty-five year-old Israeli woman. Security guards removed the activist from the hall, but Bruel asked to meet with them backstage, where he expressed sympathy for their cause. He later returned to the stage for an encore and dedicated one of the songs to Zeituni's memory. Some 2,000 people, most of them French Jews and tourists, attended Bruel's concert. Roi Peled, who had been Zeituni's partner said, "The act was meant to send a clear message that despite the recent promises and declarations made by French government officials and President Nicolas Sarkozy's wife Carla Bruni, the activists will not stop acting against French symbols and interests until the two men who ran Lee over are behind bars." Bruni recently sent a condolence letter to Lee Zeitouni's mother noting that the French justice system is working to conduct an inquiry into the case and is in constant communication with the Israeli authorities. The message came in response to a letter that Zeitouni's mother, Kate, sent Bruni. Zeituni was killed in a hit-and-run accident in central Tel Aviv last September. The driver, who escaped the scene, fled the country immediately after the accident, and was located in Paris a day later by the police. The driver and passenger remain in Paris in spite of many efforts by Zeituni's friends and family to have them extradited to Israel. 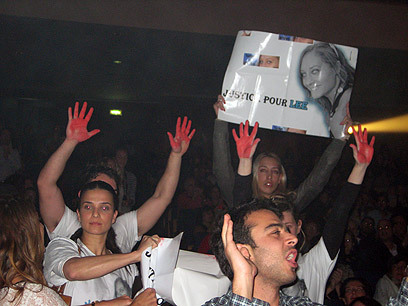 See all talkbacks "Lee Zeitouni activists disrupt French singer's show"